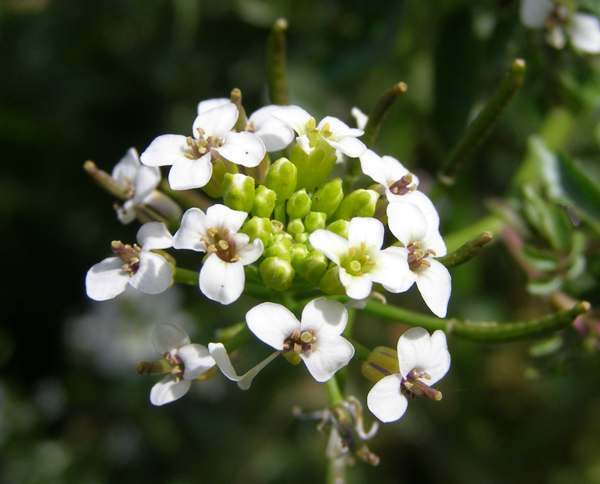 The white flowers, which are between 4 and 6mm across, have four petals. This well-known salad plant, a member of the Cabbage family, grows in shallow water and is particularly abundant in lime-rich ditches and small streams. Watercress is widespread throughout Britain and Ireland; it is native to Europe and Asia. In Britain and Ireland, Watercress blooms from May right through the summer and into October. 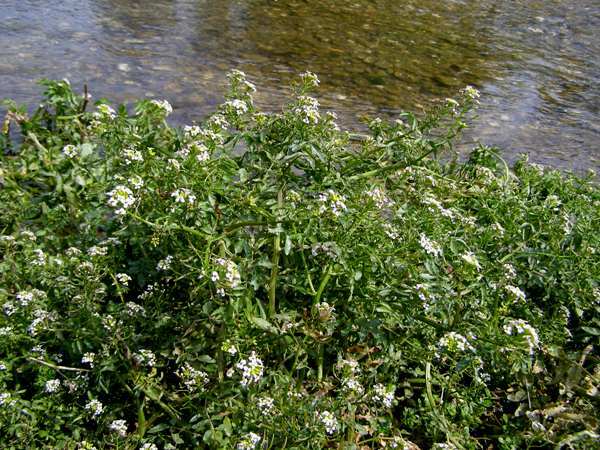 Although this is an edible plant, it is unwise to eat Watercress from streams running through sheep country or anywhere that the water is stagnant; liver flukes, tiny parasites that can attack human beings as well as farm animals, are likely to inhabit such places. As its common name suggests, Watercress is an aquatic plant. The specific epithet officinale indicates hat this plant was considered to have medicinal properties. The plants shown on this page were photographed on the River Meon, Hampshire, in June.